Text messages are becoming the primary way for people to interact with businesses, in fact, texting is the single most used feature on a smartphone. According to Statistic Brain, 781 billion text messages are sent every month in the United States as of June 2017. 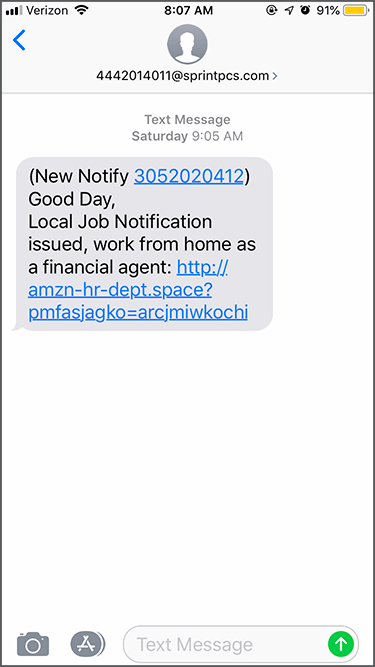 Today's scammers have taken to targeting victims via Short Message Service (SMS) text message scams in addition to traditional email-based phishing attacks. Requesting your online banking credentials to claim a cash prize. Messages implying your money is being stolen. Being accused of a crime you did not commit. Requesting information to verify tax documents. Requesting donations or aid dollars. Phishers are constantly trying new methods to trick you into clicking a link, entering credentials, or sending private information. While you may be skeptical of links included in email, those same precautions may be forgotten when receiving a text message. Since you may be less familiar with Smishing, you are less likely to be on guard. Taking the time to vet unfamiliar text messages can help prevent a costly mistake. Pay attention to the sending number: Many scammers use masking services to hide the number they are sending from. If the number is unfamiliar, use caution when replying or clicking links. Vet texts that claim to be related to your bank account: Never hesitate to call Reliant if you receive a suspicious looking text message claiming to be related to your bank account. Check the shortcode: In the United States, you can use the U.S. Short Code Directory to check the authenticity of shortcodes used to send messages. Report threatening messages: If you believe that a text message is threatening you or your family members, report it to the local authorities. Use context: Remember, if someone you know loses their phone, it could be used to send Smishing messages. If you receive a message from someone you know that seems out-of-place, be skeptical. An example of a Smishing attack.